Today's farming operations need scales that are accurate, dependable and affordable. Avery Weigh-Tronix offers proven solutions for a wide variety of agricultural applications including, but not limited to, animal scales, platform scales, grain cart (grain chaser) scales, TMR mixer scales, truck scales and bin/hopper scales. You understand the need for having accurate scales but high costs have kept you guessing. Central Carolina Scale and Avery Weigh-Tronix offer a solution... you can build your own scale! We supply the Weigh Bars and indicator and you turn them into your scale of choice. 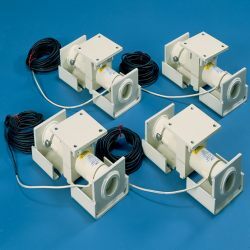 Weigh Bars can be connected directly to the indicator which operates off a 12 volt DC power source. Turn an existing pen, alleyway, or squeeze chute (cattle crush) into a livestock scale simply by bolting four Weigh Bars under it and connecting them to an indicator. Your livestock scale can be large enough for a group of animals or it can be built for a single animal. Selectable motion filtering ensures stable indicator readings so you don't have to worry about livestock moving around on the scale. System capacities up to 200,000 lbs are available. A platform scale is one of the easiest scales to build. Weigh Bars are available in capacities for any farm scale application. For example, an on-farm truck scale will save money in several ways. You can verify incoming delivery weights, pre-check weights going out to the elevator or check grain yields to compare performance of different seeds, fields or fertilizers as well as not having to worry about getting a ticket for an over-loaded truck!